- Bolt-on neck, Scale length is 25.5", 21 Frets. - Body is Ash, Neck is Maple, Fretboard is Maple. These kits are of great quality. There are a lot of inferior versions out there. Your satisfaction is guaranteed with ours with a 30 day money-back return policy. 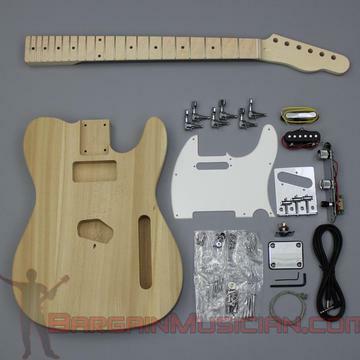 - After guitar is assembled you will have to know (or have someone) how to "set-up" the guitar. I.E. Action, truss-rod, intonation.